In GCSE maths, there are 4 ruler and compass constructions you have to know, so get your rulers and compasses at the ready and let’s get to stabbing tiny holes in some paper. – Set your compasses to a fixed length apart (any length that is more than half the length of the line will do). 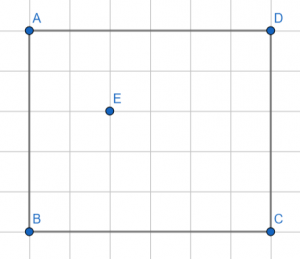 – Put your compass at one end of the line and draw an arc (blue). – With your compasses at the same length, repeat step 2 for the other end of the line (also blue). – The arcs should cross once one either side of the line. Then, draw a line which passes through the two crossing points. 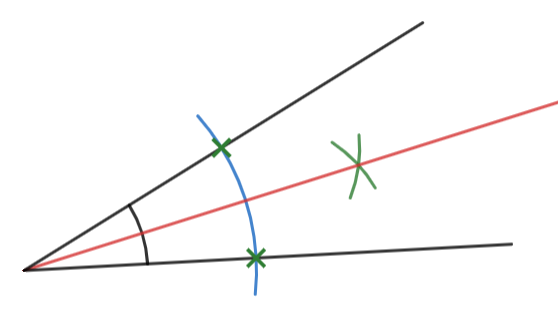 This line (red) is the perpendicular bisector. – Place your compass on the dot and draw an arc of a circle that passes through the line twice (blue). – Place your compass on the crossing point (green cross) and draw a small arc on the opposite side of the line to where the point is (green). – With your compasses at the same length, repeat step 2 for the other crossing point (other green cross). – Draw a line that passes through the original point and the point where the last two arcs cross. 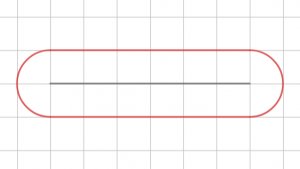 This line (red) is the perpendicular from the line to the point. – Place your compass on the corner where the two lines meet and draw an arc (blue) that passes through both lines. – Place your compass on the crossing point (green cross) and draw a small arc (green) between the lines. – With your compasses at the same length, repeat step 2 from the other crossing point. – Draw a line (red) passing through the corner where the lines meet and the point where the two green arcs cross. 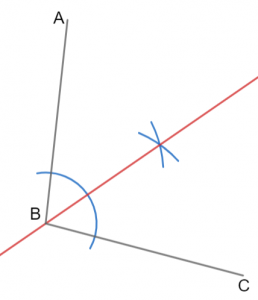 This is the angle bisector. Note: The lines drawn with your compass (the blue and green ones here) are called construction lines and shouldn’t be rubbed out – you need them to get the marks. This goes for all constructions. A locus (loci is the plural) is any collection of points that share a property. 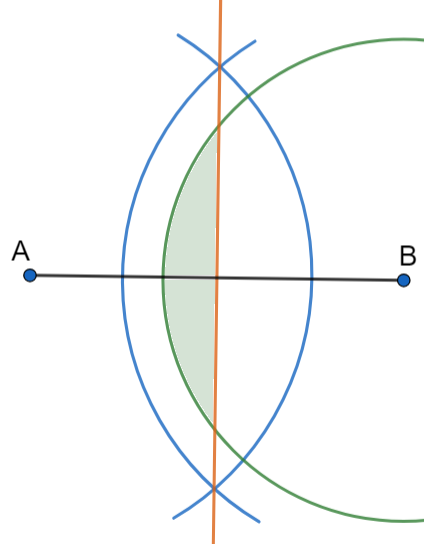 For example, a circle is the locus of all points in 2D that are the same distance from a particular point – the centre. Loci are used to solve all kinds of problems, and you may need to use the 4 constructions seen above in order to answer them. Loci questions can vary quite a bit, so I highly recommend that you try the questions below and more to get a feel for what they can ask you. 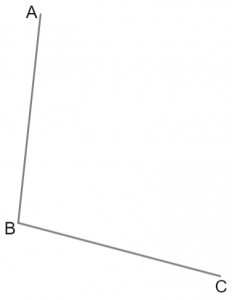 Example: Points A and B are 6cm apart. Shade the locus of points that are closer to point A than point B but less than 4cm from point B. Typically, in a question like this you would be given points A and B drawn with a lot of white space for construction around the outside (see questions below), but here we’ve just got the completed package on the right and we’re going to talk through it. Firstly, we need to find the points that are “closer to point A than point B”. 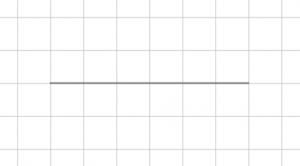 This means all the points that are to the left of the line which falls halfway between A and B. This might not seem familiar, but if you draw a line (black) between A and B then suddenly it becomes a question of drawing a perpendicular bisector. So, placing the compasses at each end and drawing two arcs (blue) of the same radius, we get the perpendicular bisector to be the orange line that passes through where the arcs cross. Now we know that we’re interested in the region to the left of that line, we must consider which points are less than 4cm from B. As mentioned, the locus of points that are a fixed distance from a point is a circle, so we set our compasses to have length 4cm, and draw a circle (green) with centre at B. Then, the locus that we’re looking for is the region which is to the left of the perpendicular bisector but also inside the green circle. The result is the shaded area. You may have noticed that this is reminiscent of that time we sliced an angle in half, and as it happens, we’re going to do that again. 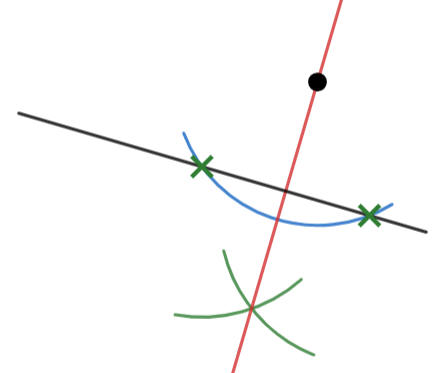 The line that bisects the angle is also halfway between the two lines that form the angle – it must be, otherwise it wouldn’t cut the angle in half. So, we place the compass at B and draw an arc that passes through both lines. Then, placing the compass at each of the points where the first arc crossed, we draw two small arcs which lie in between lines AB and BC. This one doesn’t require any of the 4 constructions from this topic, but you still need a compass and a ruler. We will break this into parts. Firstly, the locus of points which are 1cm directly above the line is another line, 1cm away from, and parallel to, this line. Same goes for the locus directly below the line. When we reach the ends of the line, it’s a little different. 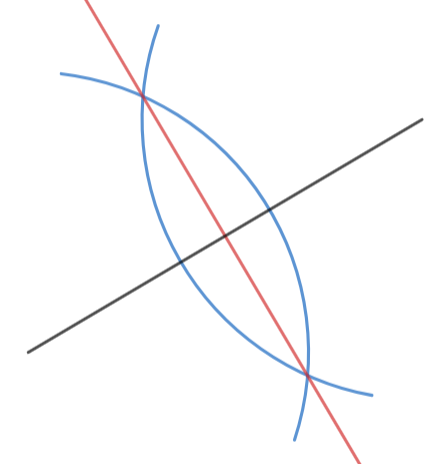 The locus changes from being a straight line to a curve. To understand this, imagine standing at one end of a line and reaching your arm out 1m in all directions. The shape that your reach forms is a curve, specifically a semi-circle – this is the locus, since your reach extends the same distance, 1m, in every direction. In short, the ends of the circle act like points, with their loci being circles (or semi-circles). The resulting picture should look like the one below (with the locus in red). 3) Bill is planning to put a fountain in his garden. His house is situated along the line CD, and there is a tree at point E. He wants the fountain to be at least 3m away from his house and at least 1.5m away from the tree. Shade the locus of points where he could have the fountain. So, for the fountain to be at least 3m away from his house along CD, we need to only consider the area to the left of the straight line which is parallel to CD and 3cm away from it. 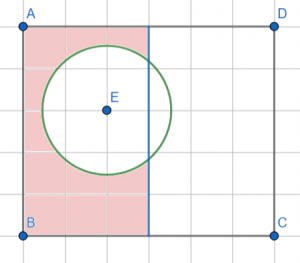 Then, the locus of points which are 1.5m away from the tree at E will be a circle of radius 1.5cm – for the fountain to be at least 1.5m away, it must be outside this circle. So, the locus of points where he could place the fountain is to the left of the (blue) line 3m away from the house, and outside the (green) circle which is 1.5m away from the tree. The correct region is shaded red on the picture below. If you are a Maths Tutor or teacher and you are looking for loci and construction resources then you are in the right place. The revision materials, question sheets and online tests that are presented are suitable for all major exam boards including AQA, Edexcel and OCR. If you would like more loci and construction questions in your question bank then take a look through the resources on this page.